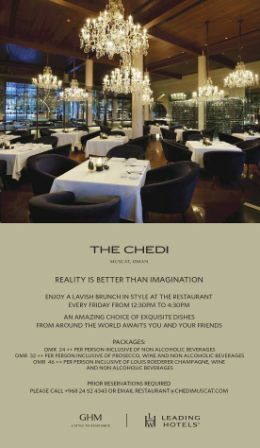 This Friday, and every one from now on, from 12:30 until 4:30pm sees the launch of The Chedi's brunch at The Restaurant. I went to Friday brunch at the Chedi in December. Very nice indeed. But like you said, it's another world in there. How can a brunch start at 12.30? Should be 11.30. Is the place also offers a good night life activity? Me and my friends is currently searching for good hangout place for this coming friday, and basing the response I've read, the place looks cool and indulgent. Went yesterday. Quality of food was good, service of drinks so frustrating. I wasn't allowed to order 2 drinks at the same time (hotel rule) - fair enough, but then when I asked for another drink it took ages to come - and we were sat right next to the bar! This, despite telling the waiter if he looked after us, we would tip him handsomely. What else could you do? 6/10, but would be 9/10 if drinks service was better. It looks very elegant here, seems like a perfect venue for weddings. Do they accept reservations to rent the place? If you are looking for a brunch venue, the More restaurant at the Opera House is delicious. The place gives an elegant and classy impression, it's surely a good place to unwind.I love the arrangements and themes like this one, that’s why I decided to renovate my house and put some chandeliers and changed my appliances into a black and white theme! By just looking at the resto’s interior design, one can say that it’s a classy and elegant place. It's amazing how the chandelier lights gave the place this kind of impression.